The Low Energy Transmission Grating (LETG) provides the highest spectral resolving power (E/ΔE > 1000) on Chandra at low energies (0.07-0.15 keV, 80-175 Å) and moderate resolving power (E/ΔE ~ 20xλ) at higher energies (3-50 Å, 0.25-4.13 keV). The LETG comprises a grating assembly which intercepts and disperses flux from the mirrors. The HRC or ACIS can be used to read out the dispersed spectra. The LETG is most commonly used for studies of on-axis observations of bright point sources. The LETG/HRC-S combination is used extensively for high resolution spectroscopy of soft sources such as stellar coronae, white dwarf atmospheres and cataclysmic variables. ACIS-S is used to read out the LETG if the low energy signal (< 0.5 keV) is of little interest. ACIS-S has higher effective area than the HRC-S in the 0.5-10 keV region and can be used for order sorting. 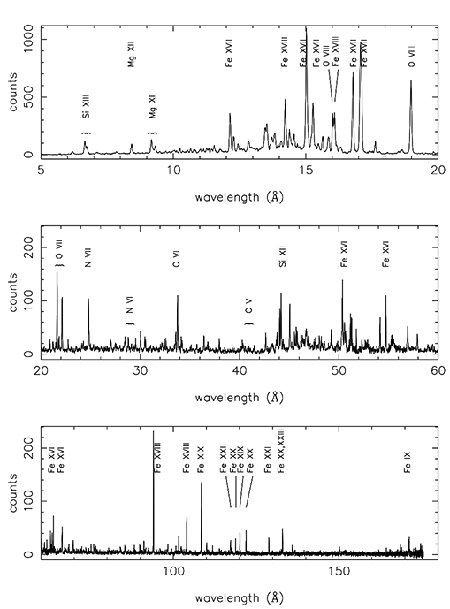 The LETG/ACIS-S is most often used for sources with harder spectra such as X-ray binaries and AGN. A complete description of LETG is given in the Proposers' Observatory Guide (POG). The Chandra X-Ray Center (CXC) is operated for NASA by the Smithsonian Astrophysical Observatory. 60 Garden Street, Cambridge, MA 02138 USA. Email: cxcweb@head.cfa.harvard.edu Smithsonian Institution, Copyright © 1998-2009. All rights reserved.